The LM&M Railroad is proud to partner with our local PBS stations for educational family fun and an opportunity to meet some of your favorite characters. 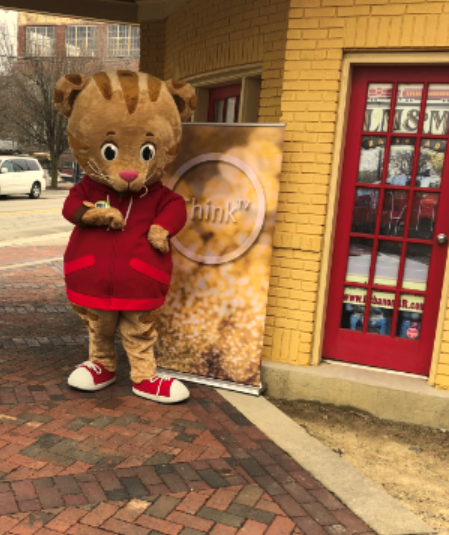 Daniel Tiger is visiting our neighborhood and YOU can say hello as he visits the LM&M Railroad depot. This family fun meet and greet event is certain to be memorable, so remember to bring your camera! Everyone is invited! You can also experience a nostalgic train ride on the Lebanon Mason Monroe Railroad by purchasing tickets. On the train, you will travel through the country side of Warren County in Southwestern, Ohio. During your ride you can listen to our informative passenger conductors describe railroad history and operations. Concessions will be available while onboard the train. Deluxe Coach class seating will be inside the Milwaukee Road 3200, Central of Georgia 663, or Southern 664 cars. These long distance coach cars seat up to 60 passengers. These cars feature comfortable reclining chairs, large picture windows, heat and A/C. Online Orders: $5.00 per ticket. Phone Orders: $3.00 per ticket.